January 07, 2016 | Michele Cohen, Ph.D. The major bronze elements of the Ulysses S. Grant Memorial consist of a heroic figure of the Civil War Commander of the Union Armies on horseback and two groups of figures representing artillery and cavalry troops in tumultuous action. Sculptor Henry Merwin Shrady created men, horses and equipment with exacting attention to the details of soldiers' uniforms, horses' tack and military equipment. 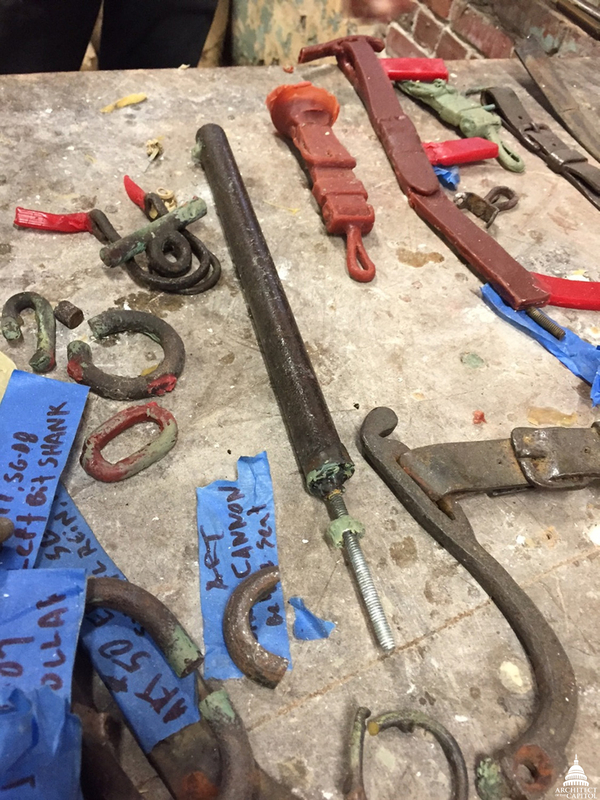 Part of the now-ongoing conservation of the Grant Memorial entails replacing over 100 missing bronze elements, including buckles, swords, chain links, straps and bridle parts. In the near-century since the memorial was unveiled in 1922, many small details have been lost due to vandalism and aging. 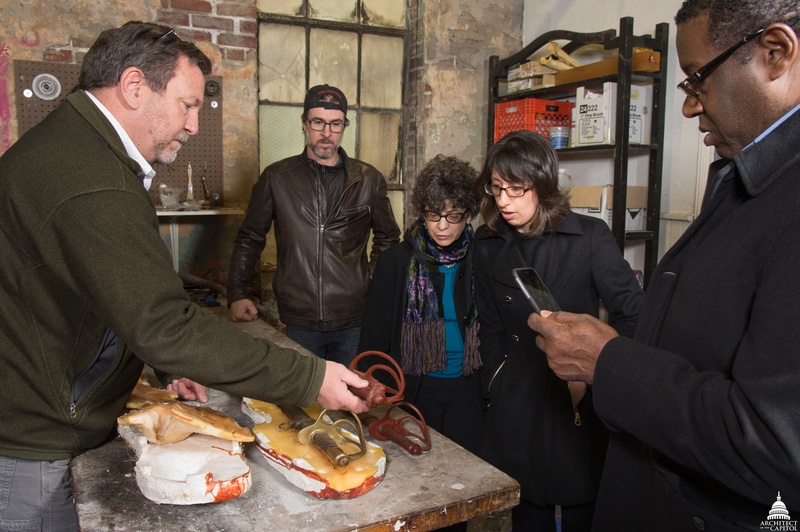 New pieces are being cast in a Philadelphia foundry under the watchful eye of the conservator and the Architect of the Capitol (AOC) team monitoring the conservation project. Care is being taken to ensure that the replicated pieces for the Grant Memorial are skillfully modeled and cast, preserving the artistic integrity. Once attached, the new pieces will be patinated to blend in with the rest of the monument, and only close inspection will reveal that they are stamped with a foundry mark that distinguishes them as modern replacements. The Grant Memorial was created using the lost-wax casting method, which allows the sculpting of finer details than sand casting (which was used for the Statue of Freedom). The replacement parts are being cast in the same way. 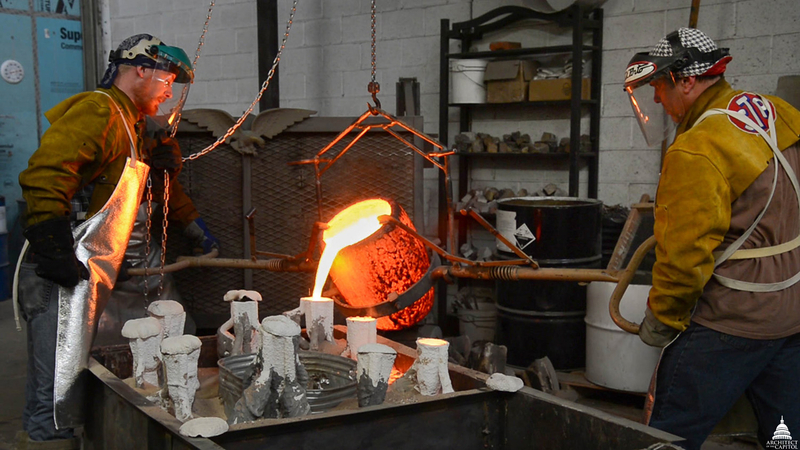 On a recent visit to the foundry, we observed the casting process in action, including the dramatic moment when the molten bronze is poured. The bronze being used for the Grant Memorial is called silicon bronze, an alloy of 95% copper, 4% silicon and 1% manganese with traces of other elements, such as iron. Silicon bronze first came into use in the 1920s and has been the preferred type of bronze for fine-art casting because it is corrosion-resistant, strong, resilient, formable, and weldable. Despite some advances in technology and materials, bronze art casting has remained essentially the same process that was used in 2,000 B.C. 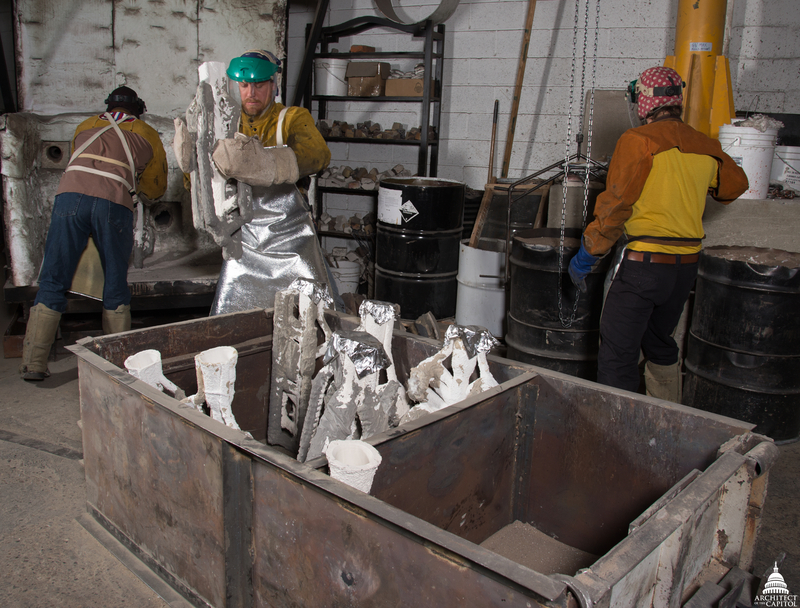 Video of recasting at the foundry for the Grant Memorial's bronze. Existing original or iron replacement elements are selected for use as models. Sometimes a new model must be sculpted based on photographs or actual Civil War–era military equipment. Several coats of silicone rubber are "painted" on the object to be cast, to create a negative mold approximately ¼" thick. Plaster is applied over the rubber mold to form the "mother mold" that will provide stability. 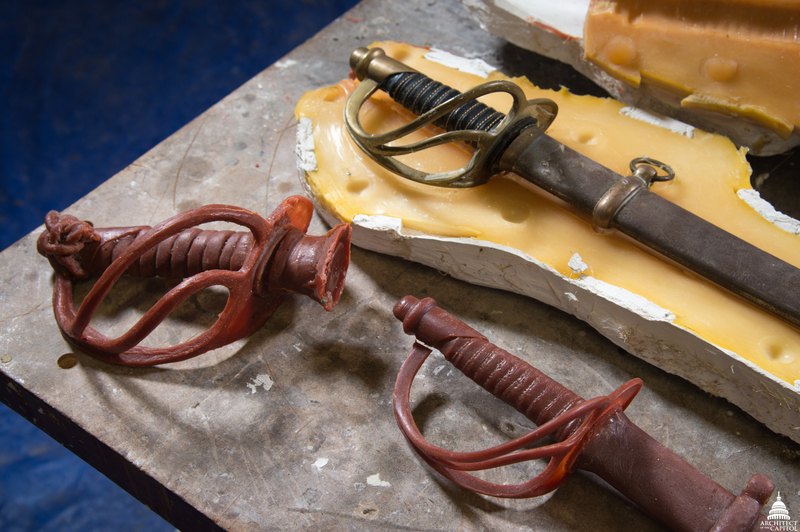 Pictured above is a sword resting upon the plaster-clad rubber mold dates to the Civil War era. 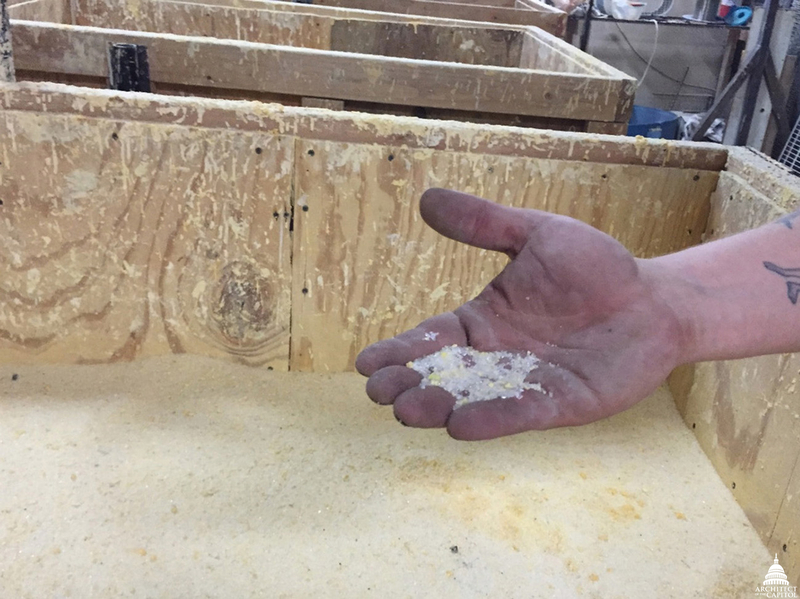 Melted wax is brushed onto the inside of the silicone rubber mold; when it hardens, the wax will become a "positive"—a replica of the piece being replaced. Our Grant components are solid castings because of their small size, so the wax models are also solid, but in a larger casting, the wax positive would be hollow, resulting in a hollow bronze cast. The rule is that whatever is wax will become bronze. Once the sculptural form is created, wax extensions or gates, called spruing, are added. The sprues will serve as a type of channel system, which will feed the molten metal to all of the areas of the sculpture and will allow gases and air to escape. Also, a wax funnel called a pouring cup is attached to the gates for use during pouring. Pictured above are several wax models for straps are joined by spruing with the pour cup at the top of the central sprue. The foundry that originally cast the Grant Memorial, Roman Bronze Works, did an exceptional job in planning how individual parts would be cast, positioning the sprues in exactly the right places. Next, a hard ceramic shell that will be able to withstand the pressure of molten bronze has to be created around the wax positive. This involves repeatedly dipping the positive into a mixture called slurry (pictured above left), rolling it in a sand-like material (pictured above right), and allowing it to dry. The texture of the sand-like material closest to the wax model is as fine as talcum powder, to capture every detail of the wax surface accurately. As the shell's thickness builds up, increasingly coarse textures are used. 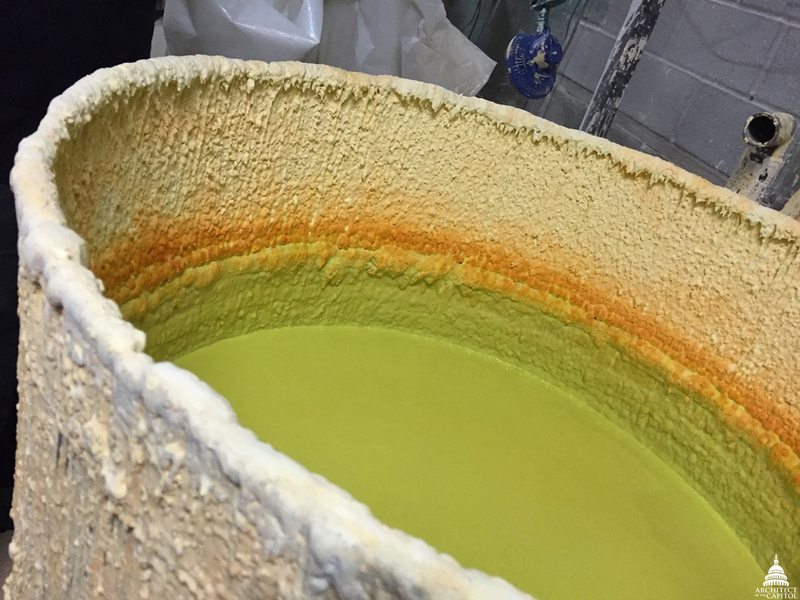 The final ceramic shell must dry for at least 24 hours; its color will change from green to yellow gold when the proper moisture level is reached. If molten bronze is poured into the shell before it is fully dry, it could explode. Once dry, the ceramic shell is heated to melt the wax out, leaving the void that the molten bronze will occupy. The three-person team that will handle the pouring positions the ceramic shells in a "sand box," standing with their funnel-like openings facing upward to receive the molten bronze. 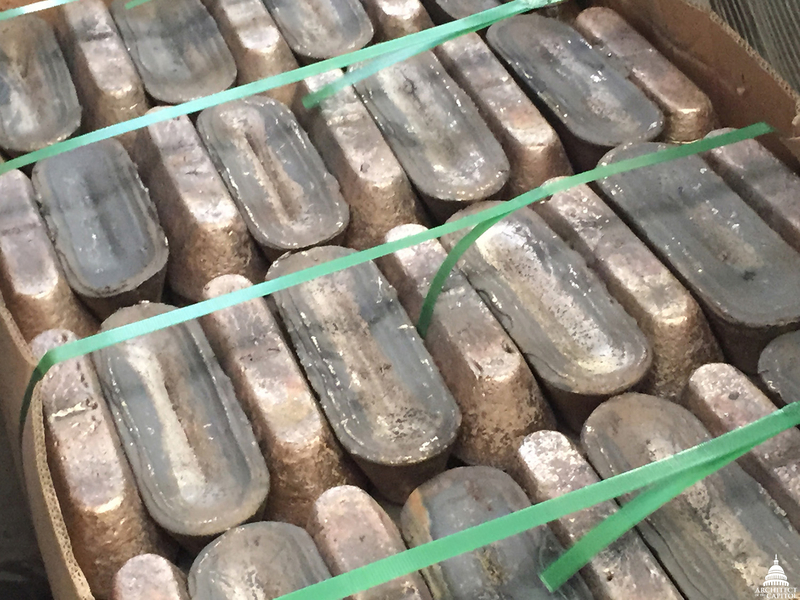 Three hundred fifty pounds of solid bronze blocks (pictured above left) are heated in a silicon carbide crucible to a temperature of approximately 2200 degrees Fahrenheit (pictured above right). 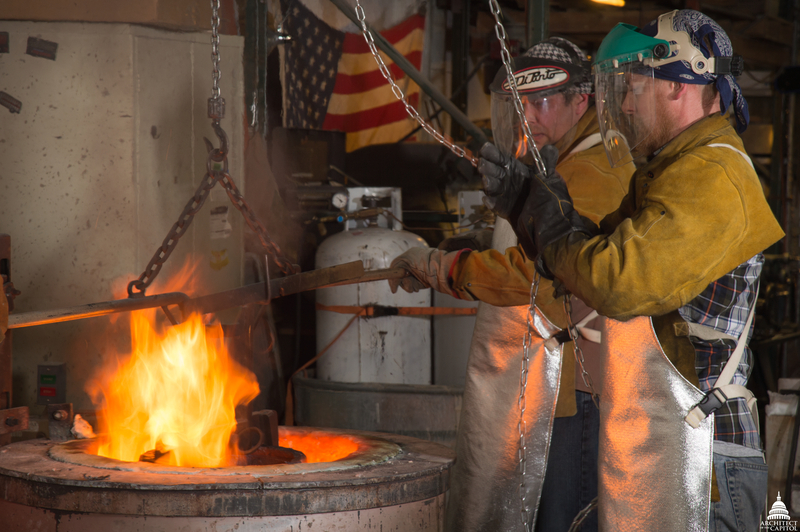 A special thermometer must be dipped into the molten metal to ensure it is hot enough. As the bronze is being prepared in the crucible, founders skim impurities off the top, very much like removing fat from the surface of chicken soup. The impurities, called slag, harden almost immediately when removed. The molten bronze is poured into the shells. A protective ceramic piece resembling a mushroom cap is placed over the fresh bronze to ensure even cooling. After one hour, some of the ceramic shell can be hammered off. Once the bronze castings are adequately cooled, they are completely freed from their ceramic shells. All gates protruding from the sculptural elements are sawed off. 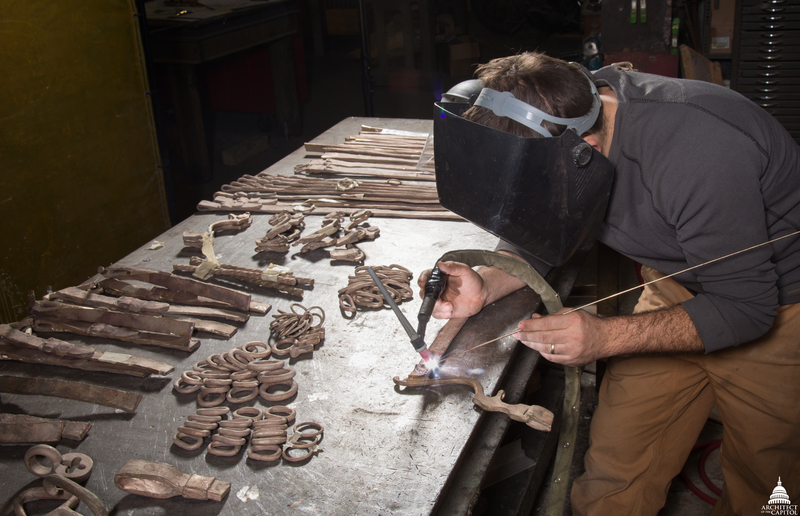 The surface of the bronze pieces is smoothed and refined by a process called chasing, which involves hammering, filing, and polishing; sometimes welding is required. A base patina will be applied in the foundry. The cast pieces will be mechanically attached to the memorial, using the same methods employed by Roman Bronze Works where possible. Final patination and coating will be performed once all the bronze replacement parts are installed. 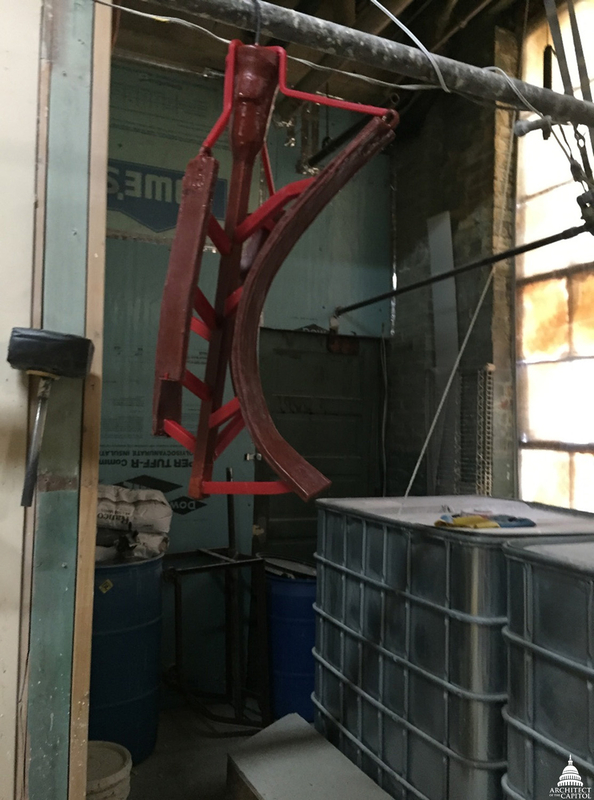 Our experience at the foundry made it clear that casting bronze is an art in itself. It requires engineering, teamwork and craftsmanship. When a bronze piece emerges from its ceramic shell, it represents the efforts of numerous individuals and careful coordination. It was exciting to watch molten bronze being poured and to see the resulting sculptural pieces that will become part of the conserved Grant Memorial. Learn more about the Grant Memorial Restoration project at aoc.gov/grant. This is wonderful and informative. Please, in the accompanying piece describing the monument--it's caValry, not caLvary. Easy mistake, but two very different things! Thanks for letting us know, Margaret! This has been corrected. This is a fantastic treasure- great job on the restoration!